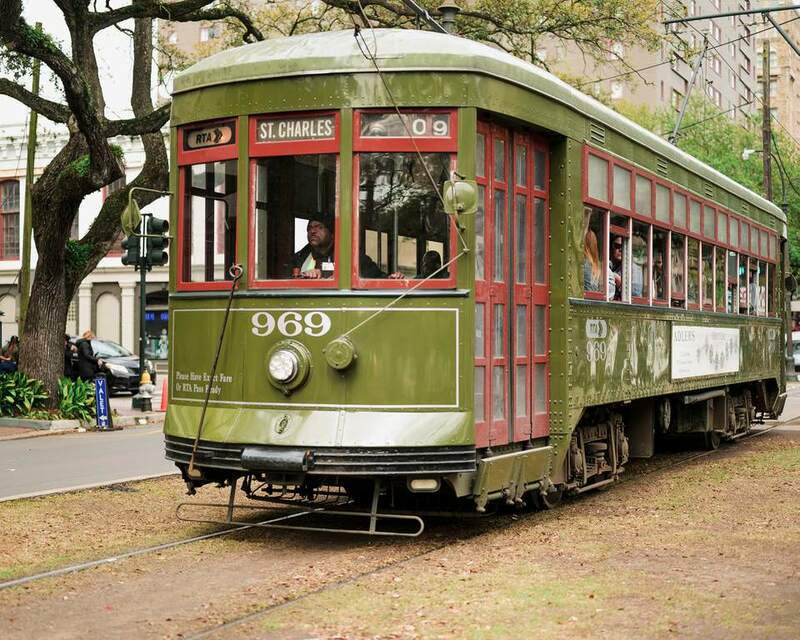 If you're in New Orleans and looking to travel from the bustling, touristy French Quarter to the elegant Garden District to laid-back Carrollton and back again, hop on the historic St. Charles Streetcar. It's just about the best thing $1.25 can buy you in this day and age. The St. Charles Streetcar is one of five trolley lines in New Orleans, and it's the oldest continuously operating street railway in the world, opened in 1835. Go to the corner of Canal Street and Carondelet Street (Carondelet is the same street as Bourbon; all streets change names when they cross Canal). The stop is on Carondelet, in front of the side windows of the Lady Foot Locker store that's right at the corner. You'll see the small yellow street sign marking it, and there's usually a group of people waiting right there. You can also catch the car at St. Charles Street and Common Street (Royal on the other side of Canal), the next stop on the line. The stop is in front of the PJ's Coffee on the ground floor of the Royal St. Charles Hotel. Sometimes this stop can be slightly less chaotic, as there are fewer people exiting the streetcar here, though sometimes the streetcar can already be full, so it's a trade-off. Download the GoMobile app, from which you can buy tickets, view schedules and routes, and see the locations of trolleys in real time. Single rides cost $1.25, but if you'd like to hop on and hop off the trolleys a few times, consider buying a Jazzy Pass for unlimited rides: A single-day pass costs $3, a three-day pass costs $9, a five-day pass costs $15, and a 31-day pass costs $55. Jazzy Passes can be used on any trolley line and on city buses, too. Single-ride tickets and single-day passes can be purchased from trolley drivers with exact change, but other multi-day passes must be bought online, at a Ticket Vending Machines found along Canal Street (cash only), at certain stores in the city, including all Walgreens, or via the GoMobile app. The entire trip takes about 45 minutes each way and gives you a grand view of some of New Orleans' most beautiful and interesting homes, the Central Business District, Audubon Park, plus Tulane and Loyola Universities. The St. Charles Streetcar runs 24 hours a day, seven days a week. There's no air conditioning in the trolleys, but the windows open for a breeze. If you'd like to hop off once or twice as you're traveling from the French Quarter to the Garden District, here are some good places to do it. In order to get off the trolley, pull the cord that runs above the windows as you're approaching your stop. St. Charles at Julia: This is the Warehouse/Arts district, and you'll find a number of excellent small galleries on Julia. The Contemporary Arts Center, Ogden Museum of Southern Art, and WWII Museum are just a block away. St. Charles at Josephine: See that big funny building that looks like a chunk of the Eiffel Tower? Well, it's a chunk of the Eiffel Tower. Sort of. It used to be a restaurant that sat near the top of the Tower, but it was disassembled and brought to the U.S. in pieces in the 1980s. A block down, you'll find the House of Broel, one of the few St. Charles Avenue mansions that you can tour, and which also houses an enormous doll collection. St. Charles at Washington: This is the preferred spot for most people who want to stroll the Garden District. Commander's Palace and Lafayette Cemetery No. 1 are both just a couple of blocks away, and the grandest Garden District mansions are all within the vicinity. St. Charles at Robert: This stop puts you just a block from a really sweet little stretch of Prytania Street that's got several nice lunch and afternoon snack options, including Upperline, La Crepe Nanou, the St. James Cheese Company, and the Creole Creamery. St. Charles at Tulane: Stroll the campus or Audubon Park from this stop or the neighboring stops in either direction. St. Charles at Hillary: Jump off here and stroll a few blocks to a nice stretch of Maple Street, which includes the excellent Maple Street Book Shop and lots of nice cafes and shops. South Carrollton at Jeannette/Birch: Transit geeks should jump off here and follow the side tracks and you can see the big sheds where they keep the streetcars. You'll also find the excellent Boucherie restaurant here.